Data Clinic were recently asked to recover the data from a damaged 4 disk Netgear NAS running RAID 5 that had been used to collect and collate drilling data for a South African mining company. Investigation of the RAID showed that of the 4 disks involved, one had suffered a serious head crash and another of the drives had dropped out of the raid set due to very bad sectors some months previously. 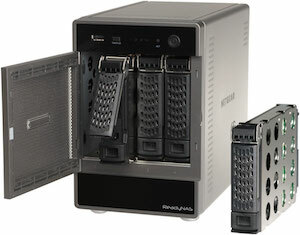 As you probably know, recovering data on RAID 5 systems is possible even without one of the disks that comprise the RAID set, so in this case we would need to repair the bad sectors on the particular hard drive and then combine the data on that drive with the other two hard drives that were still functioning. Bad sectors can cause a lot of difficultly depending on how bad the bad sector damage on the hard drive actually is. For more information about bad sectors you can read our page on bad sector data recovery here: http://www.dataclinic.co.uk/recovery-hard-disk-drive-bad-sectors/. At this point let me advise you against using ‘bad sector repair’ programs like Spinrite – these programs only have a limited effect on drives with very light bad sectors and also, on drives with serious bad sector issues stress the heads of the hard drive by continuously attempting reads from the bad sector. This often leads to further severe deterioration of the hard drive, and to read more about this see http://data-recovery-tips.co.uk/hard-drive-data-recovery-round-1/. Experience has taught us that hard drives with bad sectors are much better handled by a hardware approach. Hardware works at a much lower level as machine instructions are based directly to the drive without the operation system or other applications getting in the way and either modifying them or preventing them from executing entirely. Hardware bad sector imaging also achieves significantly better results than software imaging. So much so that in some cases software will not even detect a hard drive with bad sectors let alone be able to image it. Hardware imagers are usually able to read 100% of the drive. In the case of the South African Netgear RAID we are talking about here, we proceeded to use the hardware approach to recovering the drive. As predicted this was achieved and a few hours later the data from this drive was reintroduced to the RAID set. The data recovered was reconstructed and shipped back to the customer.